Hardscapes have been central to our landscape designs for discriminating Asheville clients for many years. 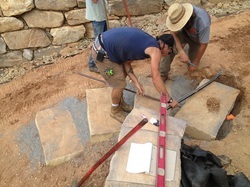 We enjoy creating a truly unique landscape using boulders, flagstone, water features, retaining walls and a variety of both native, and also non-native, improved variety plants for each of our clients. Whether you are starting with a blank canvas in new construction or have an existing space on your property that needs some attention or upgrading, we can help! Please take a moment to review some of the photos of projects we've completed over the years including stone patios, outdoor fireplaces, retaining walls, dry stream beds, and even beautiful water features. Contact Us Now For Your Complimentary Landscape Evaluation. Find out more about Carefree Landscapes water features by watching this video on a recent project.